Apple is challenging laptop users to adapt to fewer ports with the bold design of its new 12-inch MacBook, which has just one USB-C port using the USB 3.1 standard, as well as a regular headphone jack. Apple laid out a similar challenge with its first MacBook Air in early 2008, which had just one USB 2.0 port to connect peripherals and a micro-DVI port to connect monitors. But the faster USB 3.1 port is significant because it will also be used to recharge the MacBook, as well as to connect to a wider variety of peripherals such as monitors, external storage drives, printers, and cameras. The MacBook is one of just a few devices to carry the new USB port. USB 3.1 can technically transfer data between the host computers and peripherals at maximum speeds of up to 10Gbps (gigabits per second), which is two times faster than the current USB 3.0. The USB 3.1 port in the new MacBook will initially transfer data at 5Gbps, but expect that number to go up in future iterations, as the technology develops. There’s also excitement around the MacBook’s USB-C cable, which is the same on both ends so users can flip cables and not worry about plug orientation. Apple incorporated one USB 3.1 port, ostensibly for lack of space. The MacBook is just 13.1 millimeters thick and its base is dominated by batteries. Apple is clearly looking ahead with USB 3.1, which supports DisplayPort, VGA, HDMI and ethernet protocols. Here are some things to know about the USB 3.1 port in the 12-inch MacBook, and where it may be headed in the future. USB 3.1 (via a Type C connector) is the one and only IO port on the new MacBook. This means all devices running on USB 3.0 and USB 2.0 will be able to talk with the MacBook port. There are other cables besides Type-C for the MacBook to connect to older USB and micro-USB ports. 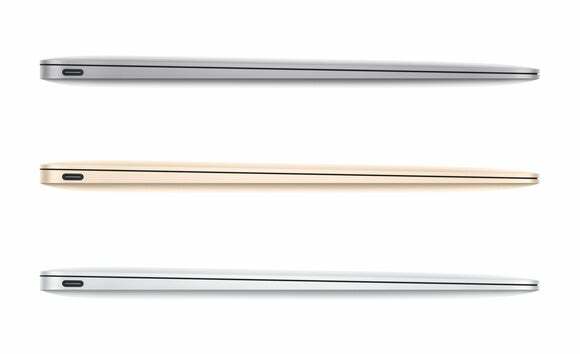 The MacBook comes with a USB Type-C charging cable, and the others will need to be bought separately. You can plug older USB devices in, but you'll need this $19 adapter. USB 3.1 chipsets are still being developed and tested, and it could be months before peripherals start appearing. In tests, USB 3.1 connections aren’t reaching the full throughput of 10Gbps, but speeds will get faster as the controllers and chipsets are refined. For one, don’t expect USB 3.1 flash drives to go on sale in the next couple of years. The lack of peripherals is a problem also faced by Thunderbolt, a faster but more expensive connector technology used in other Macs. LaCie just announced a USB 3.0 drive with a USB-C connector to fit the new MacBooks, but it won't have USB 3.1 throughput speeds. A few years ago, Apple turned to Thunderbolt as its main high-speed connector in Macs, but the arrival of the USB 3.1 port doesn’t mean that protocol will disappear. At the recent Mobile World Congress, USB Implementers Forum (USB-IF) officials said that it is possible to carry the Thunderbolt protocol on USB 3.1 copper and optical wires, and Intel hasn’t dismissed that idea either. But there would be a speed compromise, as Thunderbolt 2 delivers speeds up to 20Gbps. The AV Digital Adapter has a passthrough USB-C port for charging, plus USB type A and HDMI. If the USB 3.1 port is going to be used for charging, users will have to invest in extension cables, hubs or converters to open up the MacBook to external peripherals. Apple is selling a USB Type C to USB converter for $19, an extension cable for $29, and if needed, a USB-C power adapter for $49. 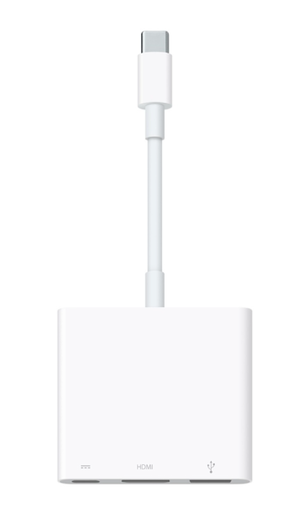 Apple is also selling a $79 USB-C Digital AV Multiport Adapter so the new MacBook can simultaneously connect to a 1080p HDMI display, USB 3.0 device and a USB-C charging cable. USB-IF believes the current speed of USB 3.1 is enough, but has also simulated speeds of 20Gbps over copper wire, putting it in the same league as Thunderbolt 2. There’s little doubt that USB-IF wants to ratchet up the data transfer speeds, especially with 4K video on the horizon. But the organization for now has more important priorities, like making USB 3.1 a port that can be used to charge laptops, mobile devices and appliances. The port will start appearing in more mobile devices starting in the first half of this year, and is not in appliances yet. Next target, iPhones and iPads? Does the USB 3.1 port spell trouble for the Lightning connector in iPhones and iPads? Only time will tell, but USB 3.1 has its own benefits in mobile devices. For one, USB 3.1 will support the upcoming MHL (Mobile High-definition Link) 3 specification, which can stream 4K video from mobile devices to TV sets. TV sets will ship with specific HDMI ports that support MHL, and users would need a cable that is USB Type-C on one end and HDMI Type-A on the other end to stream mobile 4K video to TV sets. Besides putting USB 3.1 ports in its mobile devices, Apple will need to support MHL on the devices.